Bob Wallace, originally from New Zealand, became Lamborghini's test driver in 1964. He had experience from racing Ferraris and Maseratis and remained a valuable resource for the factory for several years. His efforts in the development of the Miura were indispensable. He experimented with some of the cars, rebuilding at least two of them into racing cars. The Jarama Rally and the Urraco Bob are his works. 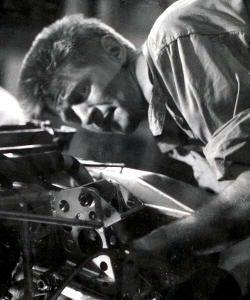 The image shows him working on a Maserati Tipo 61 "Birdcage" in the early 1960's, courtesy of the Robert Wallace Estate.